If Showa can be called the King of Koi, then Kohaku certainly wears the Queen’s crown. 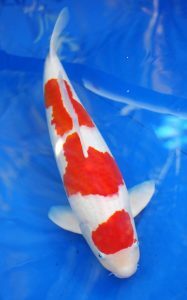 This red and white beauty is one of the “big three” in koi shows, along with Showa and Sanke, which are both three-colored koi. An old adage goes something like “The road to nishikigoi begins and ends with kohaku”. This refers to the attraction that the simple beauty of red on white has to the beginner, and to the many intricacies and challenges that this variety presents to the advanced hobbyist. 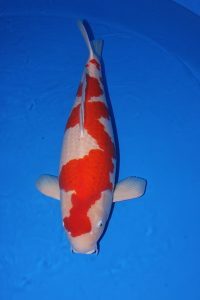 Indeed, the first koi many of us see is a kohaku, to which we inevitably respond: “My what a pretty goldfish!”. Not until we buy it, take it home, and watch as it grows. . and grows. . . and grows. . . do we finally realize that this is no ordinary “goldfish”. The road to Nishikigoi has begun. Later, when many of us take to showing koi, and have collected examples of our favorite varieties, we begin to search for that “special” kohaku. We learn that there are certain rules that need to be followed when it comes to a kohaku pattern. For instance, we don’t want the head covered in red and we prefer not to have red in the fins. Ideally the red comes to just past the eyes, leaving the rest of the head down to the mouth in white. An attractive exception to this rule is “kuchibeni”, or “red lipstick”, which is self-explanatory. Also, the pattern should be bold rather than spotty, and it should wrap down to the midline or lateral line, giving the koi a powerful look. The classic pattern is a three-step pattern, which would have one red marking on the shoulder area, a large marking at the middle section, and a smaller red mark just before the tail. Similar to the “head” rule, the tail should also end in white. This is called a “tail stop” and refers to the last red marking stopping about ½ inch from the beginning of the tail fin. Another popular pattern is the lightening, or inazuma, pattern. This is a single red marking zig-zagging down the entire length of the koi. Balance of the pattern is important also. It should look pleasing to the eye – not too heavy on one side or the other. Finally, the edging of the red, known as “kiwa”, should be sharp and clean. A blur at the leading edge (towards the head) is OK if it is only one scale wide. All of this red should sit on a canvas of pure porcelain-like white. 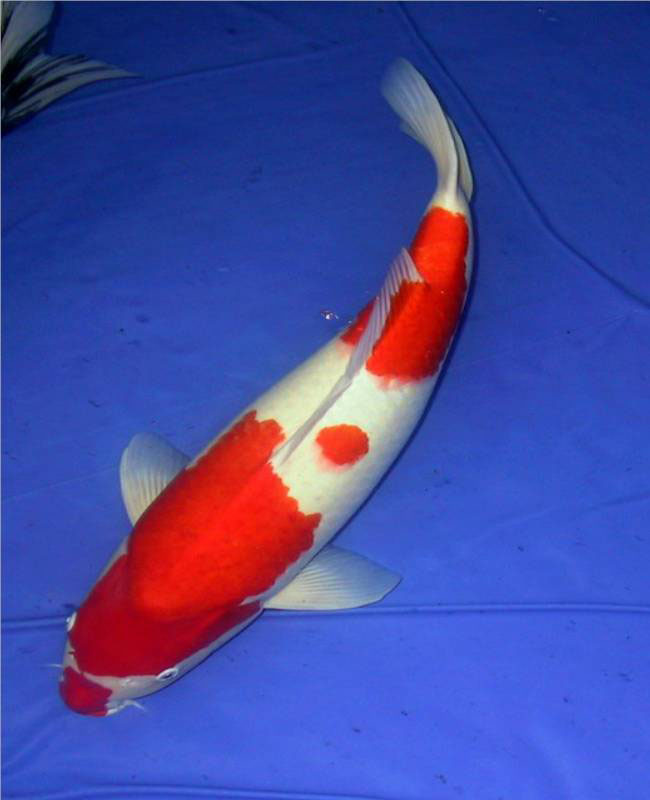 Next time you are visiting a trade show or a koi dealer, take the time to study the kohakus. Bowl five or six of them up – study patterns. Study body shapes. Study color and skin quality. Maybe you’ll spot a “special” kohaku that will take you a little further down the road that is Nishikigoi.